The 2010 Alfa Romeo TZ3 Stradale was created to celebrate Alfa's 100th anniversary. This rare beast (number 7 out of 9) is based on the Viper ACR and powered by the same 640hp, 8.4L V10 mated to a 6-speed manual transmission. Ferrari of Newport Beach has it listed for $700k. 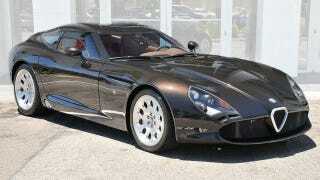 This is an absolutely stunning combination of Zagato bodywork and fire-breathing, American V10 madness. To make it even more special the car is BROWN! Red and yellow Italian supercars are nice...but predictable. The metallic brown over chestnut enhances the TZ3's blend of vintage and modern styling.